Imagine issuing a press release for your startup announcing an almost 3000% year-over-year growth. I recently joined LemonStand, a Vancouver-based SaaS eCommerce platform startup as VP Growth, and I’ve spent a good chunk of my first few weeks digging into where we’re at, how we got here, what worked and didn’t work along the way to better help us accelerate our growth trajectory. In the hope that sharing some of this learning will you to grow your startup, I’ve summarized some of the key things I believe have driven our success to date. For those unfamiliar with LemonStand, it was first launched as licensed software back in 2010 by Danny Halarewich. LemonStand quickly built an early customer base and following especially among web freelancers and agencies. Early customers told us they liked the end-to-end design and development flexibility of the software’s templating and API approach, but many of them didn’t really want the overhead and responsibility for the web hosting infrastructure that went along with a licensed solution. We also learned that as demand for traditional on-premise software was shrinking, selling perpetual licenses with very little recurring revenue made it difficult to continue investing in making the platform better for customers. This combination of challenges could have resulted in a dead end but in late 2012, Danny made a brave decision to pivot the company and completely rewrite the software as a native multi-tenant software-as-a-service solution. In early 2014, we soft launched our SaaS platform hoping that it would appeal to businesses focused on building unique and differentiated online shopping experiences, who didn’t want to manage hosting, security, or third party support on an open-source software. Don’t be afraid to make a direction change quickly once the need becomes clear. When we first launched our SaaS platform, it was definitely a “minimum viable product.” We knew there were maturity gaps, but we also knew that there was a lot we didn’t know and rather than trying to anticipate everything, we chose to learn from our early adopter customers. We had the benefit of a small community of what I like to call “friendlies”: many of whom were familiar with us through our original licensed product, interested to move to a SaaS delivery platform, and willing to trust that we’d mature the platform quickly. We spent a lot of time with them, using their guidance to build a differentiated platform in a competitive and fast changing market. By soft launching with an only partly baked product, we minimized the time wasted going off in the wrong direction. By iterating quickly to fill gaps and show real progress, we built confidence and our customers started to talk more about us, spreading the word and contributing to our growth. 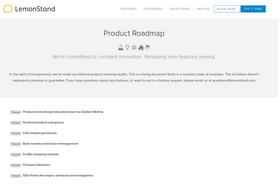 vailable product development roadmap that we keep updated religiously. 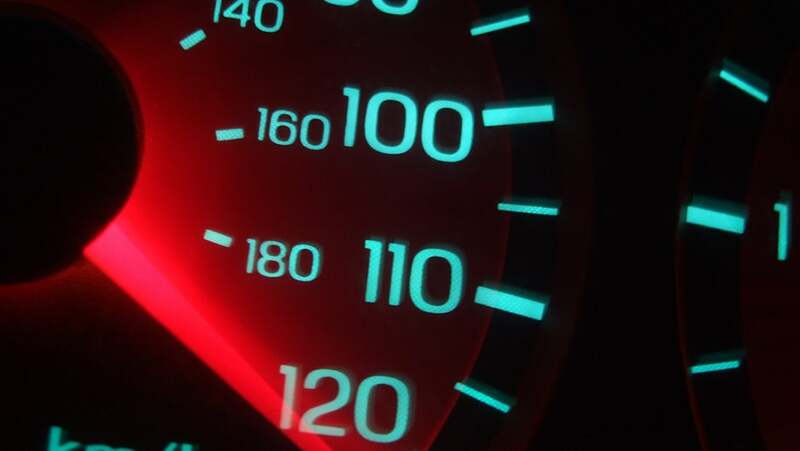 The goodwill that both the transparency and the quick progress have bought us may not be directly measurable but comes through loud and clear from our customers on a daily basis, who wish that other vendors would do the same. Transparency with our team is also something we believe is very important. Everyone on the LemonStand team, regardless of function or level, knows exactly how we’re doing as a business, our goals and challenges, and how they can have an impact. We think there is opportunity to be even more transparent externally and love the approach that companies like BareMetrics, Buffer, Groove, and Unbounce have taken to expose the inner workings of their businesses, and we plan to do more of this going forward. Many startups are afraid to share the inner workings of their company, worried that exposing their challenges might make them weaker, but from what I’ve seen the opposite usually happens. Being transparent with your stakeholders can build goodwill and support and is something to be embraced. We’re still very early stage, so everyone on our team, right up to our CEO, is responsible for customer support. Customer feedback to date has been resoundingly positive on the quick response times, knowledgeable support and accountability taken by every member of the team. Your customer’s experience of your product or service is the number one influencer on your brand perception, and I personally am a big believer that customer satisfaction and willingness to recommend, which we measure through Net Promoter Score. By being laser focused on helping your customers succeed, you can not only reduce churn and increase lifetime value, you turn them into word of mouth marketers for your product or service. We’re a small company with big aspirations, and while it would be exciting to say that our platform is for ”anyone to sell anything anywhere” (hmm, that sounds vaguely familiar), it isn’t true today and we don’t plan for that to change. While it sounds like it would be great if anyone could set up an online store with no skills or knowledge in 5 minutes or less, the problem with the concept is that if anybody can, inevitably anyone does and in many cases failure will result since they then have no idea how to build a real business and/or don’t have the willingness or resources to hire the talent that can help them. There is definitely a reason that of the 12-24 million online stores that exist worldwide more than 95% of them generate annual sales of less than $1,000. Ouch! In a world where eCommerce sales as a percent of retail sales in the US are still less than 7% but consistently taking a bigger piece of this huge and growing pie each year, we’re going to stay focused on helping serious entrepreneurs build their brands and businesses online, confident that our addressable market will get a lot bigger for a long time to come. As with all SaaS models, we’re built for recurring revenue, so we’re targetting a subset of the market who we believe can have success using our platform and give them reasons to choose us and to stay with us long term. Since our initial soft launch, we’ve spent a lot of time learning about our most successful early adopters and developing and refining 2 key personas we think represent the best fit for LemonStand today. I’ve summarized them at a high level below. New Store Nolan/Nancy (NSN) – a technology and social media savvy entrepreneur (or serial entrepreneur) who is launching a new business or has run into limitations with his/her current platform. NSN understands product distribution, sourcing, and the logistics of running an online retail business and is willing and able to hire (in house or external) expert talent for design, development, integration or marketing that will help build a serious business of 6-7 figures annually. NSN requires tools for in depth analytics and conversion rate optimization, and a platform that’s flexible enough to support innovative business models and marketing strategies. Web Designer/Developer William/Wendy (WDW) – We quickly recognized that a key player in the platform decision is the design/development expert who is ultimately responsible for creating a unique shopping experience to help NSN build a presence and brand that differentiates theme in their niche and ensures maximum conversion, profitability and growth. WDW wants to work with modern technologies that supports their workflow and gives them the flexibility to achieve their design goals and integrate to other technologies. WDW may be in house talent, but in many cases works as a freelancer or agency. 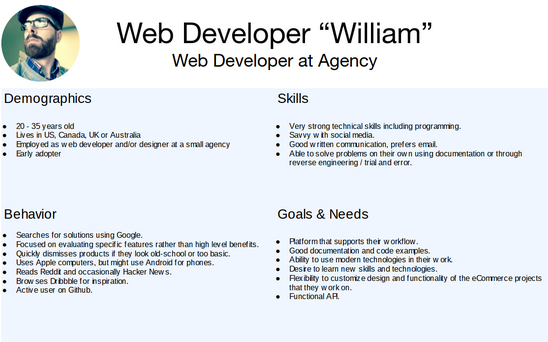 I’ve shared an example of a persona summary for William below. These personas, while always a work in progress that we’ll continue to refine and hopefully expand on over time, heavily influence our product, positioning, marketing and content strategies. A great example of this is that WDW has made it clear that partnering with freelancers and agencies who specialize in design, development and conversion rate optimization for eCommerce are an important channel for us, which is why we recently rolled out a partner program where we share a percentage of recurring revenue with them for each customer they bring us. By staying very focused on product/market fit and keeping your buyer personas up to date you can clarify strategy and ensure everyone on your team is focused on the right things. We’re in a large, fast growing market which has a mix of commodity, enterprise and niche vendors. There is a lot of price competition at the low end, and there are huge price barriers at the high end. As a startup, we wanted to prove that we could deliver value that a customer was willing to pay for and would allow us create a sustainable business that we could grow. If you don’t know what a customer is willing to pay or how you’ll make money, you don’t really know if you have a business. We focused on charging for our product from day 1 and have had to experiment to determine willingness to pay and get feedback on perceived value. We’ll continue to do so as we and the value we deliver grows. By charging for our product early, we established that we had actually built something that customers would pay for. Don’t make the mistake of giving your product away for free and figuring out how to make money later and don’t be afraid to experiment with pricing to understand willingness to pay. Pricing is as much an art as a science. If there were something we as a team wish we’d done sooner, it is definitely content marketing. We’ve all recently read Traction by Gabriel Weinberg and Justin Mares, which lays out a great framework for startups to evaluate 19 different growth channels, and prioritize and test each to achieve traction in their market. When we did our prioritization (I’ve included a screen capture from the prioritization sheet we used below), content marketing came out on top. While we’ve had a blog since we launched at the beginning of last year, we really only started to focus on it and align our content and promotion efforts around our customer personas 6 months ago. Content marketing is a lot of work in the early days but done well is the online marketing equivalent of the gift that keeps on giving when it comes to customer acquisition. We are big followers of best practices preached by KissMetrics, and are constantly learning and experimenting to improve here. One of the benefits to our pivot is that we basically restarted as a business from ground zero. Our soft launch in January of 2014 was purposely very soft and so for the quarter through March that year our subscription revenue was just a small trickle. The great thing about recurring revenue is that it gives you a base to grow quickly from and our trickle of new customers has turned into a small stream since then, which by the end of March, 2015, resulted in a pretty exciting year over year growth percentage. At LemonStand, we’re excited to be involved in a massive, fast growing market and have some big growth goals for the year ahead. We’ve also got challenges and unknowns standing in the way of achieving this growth, and I’m looking forward to sharing more on how we fare and what we learn. VP Growth at LemonStand, entrepreneur, advisor and investor with over 15 years experience in startups and high growth technology companies.